Myeloid or granulocytic sarcoma is a tumor mass consisting of myeloid blasts, with or without maturation, occuring at extramedullary sites. It preferentially involves orbits and the subcutaneous tissue, but it may also occur in paranasal sinuses, lymph nodes, bone, spine, breasts, thyroid, salivary glands, small bowel, lungs or various pelvic organs. It’s presentation in lacrimal gland is a very rare entity, where the tumor may occur prior to or after the diagnosis of underlying disease. We report a case of myeloid sarcoma in a 10-year-old male who presented with protrusion of right eye and lid swelling progressively increasing in size for 1 month. Complete excision of the tumor and histopathologic diagnosis revealed evidence of Acute Myeloid Leukemia (AML). There were no other sites indicating any tumoral process; however, the bone marrow aspirate andthe peripheral blood smear revealed an evidence of systemic disease. Myeloid sarcoma, although rare, should be considered as one of the differentials when a paediatric patient presents with proptosis or eyelid swelling. Myeloid sarcomas are rare complications of de novo AML . The diagnosis of AML is based on finding greater than 30% myeloid blasts in the bone marrow. Myeloblasts have delicate nuclear chromatin, two to four nucleoli. The cytoplasm often contains fine, azurophilic, peroxidise positive granules often represented by auer rods. Evaluation of the peripheral smear is an invaluable tool in the diagnosis . In AML, the immatureblast cells are released in the blood circulation, reaching distant extramedullary sites including the lacrimal gland. Accumulation of these leukemic cells in the soft tissues is termed as Myeloid Sarcoma [MS]. MS has been reported in 2.5 to 8% of patients with AML . The occurrence of lacrimal gland myeloid sarcoma in children before the development of systemic leukemia, may frequently be confused with malignant tumors such as rhabdomyosarcoma, lymphoma and neuroblastoma. The accurate diagnosis of these cases can be challenging, particularly when there is no evidence of systemic disease and imaging featuresare not sufficiently specific to distinguish myeloid neoplasm from other tumors [4,5]. A 10-year-old male child came with complaints of protrusion of right eye and lid swelling for 1 month. Computed Tomography [CT] scan showed a well-defined, poorly marginated soft tissue mass involving the lacrimal gland, superior rectus and lateral rectus muscles of the right eye. Clinical diagnosis was an orbital pseudo tumour with a differential diagnosis of a lymphoma. 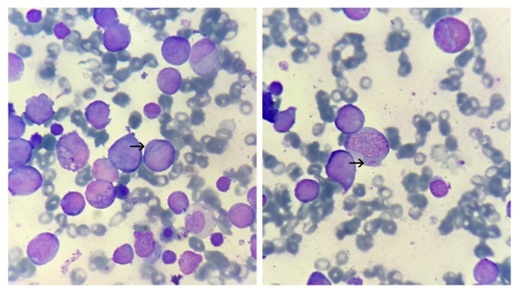 The peripheral blood smear report was suggestive of an acute leukemia with the blast count of 40% (Figure 1). The bone marrow findings were suggestive of an acute leukemia of myeloid origin (Figure 2). 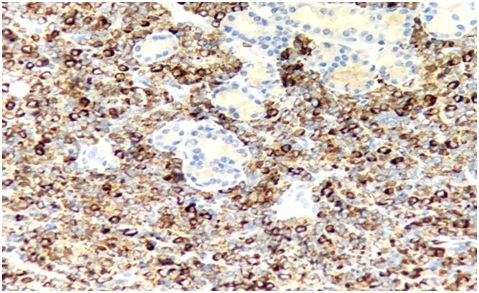 Right sided lacrimal gland mass biopsy report revealed a myeloid sarcoma (Figure 3) confirmed by Myeloperoxidase [MPO] positivity (Figure 4). GS [Granulocytic Sarcoma] (also called chloroma) was first described by the British physician, Burns A in 1811 .The diagnosis of a GS can be difficult and sometimes it may be misdiagnosed. These tumors can occur anywhere in the body and they have to be differentiated from lymphomas, carcinomas or infectious process [7,8]. Due to the low incidence of myeloid (granulocytic) sarcoma, it is not possible to develop a proper algorithm for its diagnosis and treatment. Few descriptions that are available in the literature neither give an idea of the variety of manifestations and the order of organ involvement, nor allow any vital prognosis. Verification of the diagnosis can only be based on immunohistochemical findings of the primary tumor and bone marrow biopsy material . In our case, the lacrimal gland architecture was effaced by infiltration of diffuse, monotonous population of immature myeloid or blast like cells, which on special stain turned out to be MPO positive. The bone marrow aspirates revealed proliferation of blast cells with Auer rods which were positive for myeloperoxidase stain. The peripheral blood smears also showed myeloblasts with Auer rods in the cytoplasm. The overall histopathologic appearance, peripheral blood smears and bone marrow smear findings with MPO positivity, was consistent with the diagnosis of extramedullary acute myeloid leukemia in the form of mass involving lacrimal gland [myeloid sarcoma]. Myeloid sarcoma, although rare, should be considered as one of the differentials when a paediatric patient presents with proptosis or eyelid swelling. Byrd JC, Weiss RB, Arthur DC, Lawrence D, Baer MR, et al. (1997) Extramedullary leukemia adversely affects hematologic complete remission rate and overall survival in patients with t(8;21)(q22; q22): results from Cancer and Leukemia Group B 8461. J Clin Oncol1 15: 466-475. Wani RM, Rashid S, Mir AM, Suraya S (2015) AML presenting as bilateralproptosis with lacrimal glands involvement in a young male. Int J Med Res Rev 3: 669-672. Mitkowski D, Gil L (2017) Isolated myeloid sarcoma as the first manifestation of acute myeloid leukemia: A case study. Clin Case Rep 5: 1802-1806. Rajput D, Naval R, Yadav K, Tungaria A, Behari S (2010) Bilateral proptosis and bi-temporal swelling: a rare manifestation of acute myeloid leukemia. J Pediatr Neurosci 5: 68-71. Alkatan H, Chaudhry IA (2008) Myeloid sarcoma of the orbit. Ann Saudi Med 28: 461-465. Kundu S, Chatterjee S, Mondol D, Dastidar AG, Roy A (2008) Extramedullary granulocytic sarcoma. Indian J Med Paediatr Oncol 29: 28-30. Bangerter M, Hildebrand A, Waidmann O, Griesshammer M (2000) Diagnosis of Granulocytic Sarcoma by Fine-Needle Aspiration Cytology. Acta Haematol 103: 102-108. Brijesh Thakur, Kachnar Varma, Vatsala Misra, Smita Chauhan (2013) Granulocytic Sarcoma Presenting as an Orbital Mass: Report of Two Cases. J Clin Diagn Res 7: 1704-1706. Likhvantseva VG, Safonova TN, Kuzmin KA (2016) Primary granulocytic sarcoma of lacrimal gland. Vestn Oftalmol 132: 82-89. Figure 1: Peripheral smear: Showing myeloblasts (arrow) with Auer rods. [Leishman’s stain: 1000x]. 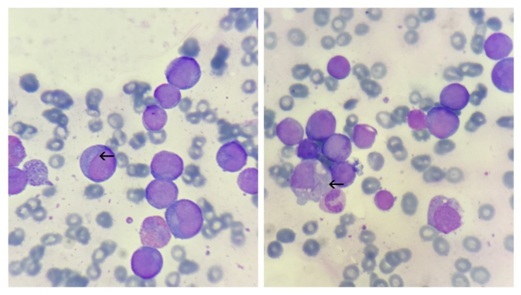 Figure 2: Bone marrow smear: Showing myeloblasts (arrow) with Auer rods. [ Leishman’s stain: 1000x]. 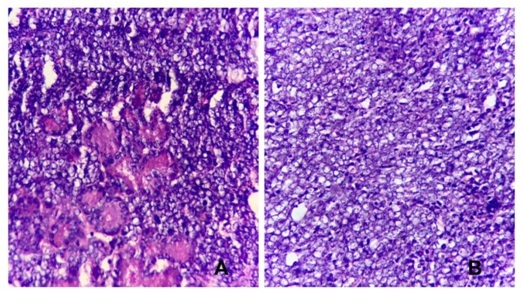 Figure 3: Lacrimal gland biopsy: showing diffuse sheets of large blast cells resembling large cells infiltrating the lacrimal gland (acinar structures in 3a). [H&E: 40x]. Figure 4: Lacrimal gland biopsy: showing infiltrates of myeloblasts with diffuse MPO positivity. [MPO: 40x]. Citation: Londhe RU, Swami SY, Valand AG (2018) Myeloid Sarcoma of Lacrimal Gland: A Case Report. J J Cytol Tissue Biol 5: 018. Copyright: © 2018 Londhe RU, et al. This is an open-access article distributed under the terms of the Creative Commons Attribution License, which permits unrestricted use, distribution, and reproduction in any medium, provided the original author and source are credited.